Funny story: I actually bought this box of Pop-Tarts at an Asian grocery store that had very few American products. I was gleaming because I thought I'd found a rare Pop-Tart. I mean, Chocolate Mint... surely Kellogg's wouldn't try to put that in America's toasters for breakfast. It was weird. It's a flavor that has never been associated with American breakfast. Certainly, this was a Pop-Tart from the Orient... exotic and strange. Two weeks later, I saw them with the Blueberry Pop-Tarts at my local All-American Ralph's Grocery Store. I stand by my initial impression. Chocolate Mint for breakfast is weird. And I love those flavors... Thin Mints from the Girl Scouts, Junior Mints... I love 'em. But when you try to cram those flavors into a Pop-Tart, the result isn't nearly as good... not by a long shot. This product doesn't taste like a delightful cookie. It tastes like the "artificial flavors" it admits to on the box. Believe me, I was ready to add chocolate mint to the pantheon of breakfast flavors. I could see chocolate mint pancake syrup... Chocolate Mint Cheerios... but a few nibbles of these Pop-Tarts put those dreams to rest right away. While this review leans toward the negative, I would advise people to give this product a try. It's a novelty Pop-Tart that I'll be very surprised to see on my store's shelves two years from now. Get them while you can. And please post your thoughts. I'd love to hear some different opinions. 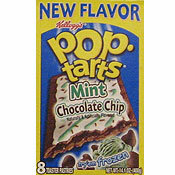 What do you think of Mint Chocolate Chip Pop-Tarts? You find something you like and then just like that they're gone. Not cool Walmart. There's got to be a way we can get them back in stores. I just visited a site that wanted 15 freaking dollars to send two boxes by mail to my house. Wtc? Boo to Kellogg's for taking my MCC Pop-Tarts away from me. -_- I literally stopped eating their products when I found out they were discontinued. When you go to the Kelloggs site, and search them, they don't even show up? Why? These pop tarts are delicious and need to be brought back, NOW! I thought they were awesome. Absolutely fantastic. I love them my kids love them. Where are they????? I'm upset. I like them, but cannot find them! I LOVE THESE POP-TARTS!!! But I don't think they sell them anymore. I miss them. I think they taste like tooth paste. These are great people, frozen or toasted.Mint and chocolate -- you can never go wrong. I'm a tattoo artist, so I eat them after work as a midnight meal yum. I'm buying them up at a discount price while they are still on the shelves because I figure they are not going over well with the masses and won't be available for long. I totally disagree. They sound gross, yes. But they are DELISH! But where can you find them? I'm on the east coast, and have yet to them in the supermarkets. Any ideas? My 3 children love them. We can only buy them at one store around here and they have run out of them. I must be weird. I loved them toasted! I don't like them for breakfast, but they're good frozen as a snack. The top tastes mildly salty, which is kind of weird. Meh, I admit they're awesome frozen but it doesn't give me that cool refreshing feeling Mint Chocolate usually does. 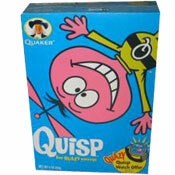 Plus, half of the fun of eating this flavor is picking out the chocolate chips. Don't they know that? I wouldn't be ready just yet to cut the Mint-Chocolate combination from breakfast just yet. These pop-tarts aren't great, but they obviously had potential. I'd be more than willing to try another breakfast food with these flavors. Try them "frozen" they are 200 times better when frozen. I agree. I'm also a mint chocolate lover, but these pop tarts were very disappointing. This product is really great - it is my favorite pop tart in the world - it is my favorite breakfast food in the world. It is in fact my whole families favorite thing in the world to eat we just eat them all of the time I even love them frozen they are sooooooo etc you get the point. They are great. I tried them frozen. They were ok but it tastes like they put way too much mint in them.